Chinatown is one of those movies that you’d be better off watching in black and white to get that real film noir experience. Representing the very best in the tradition of film noir, this classic was honoured by the American Film Institute when they released their “100 Years, 100 Movies” list. It placed #19 on that list, which ranked even higher than the Oscar-winning The Godfather Part II of 1974 (which placed #32). 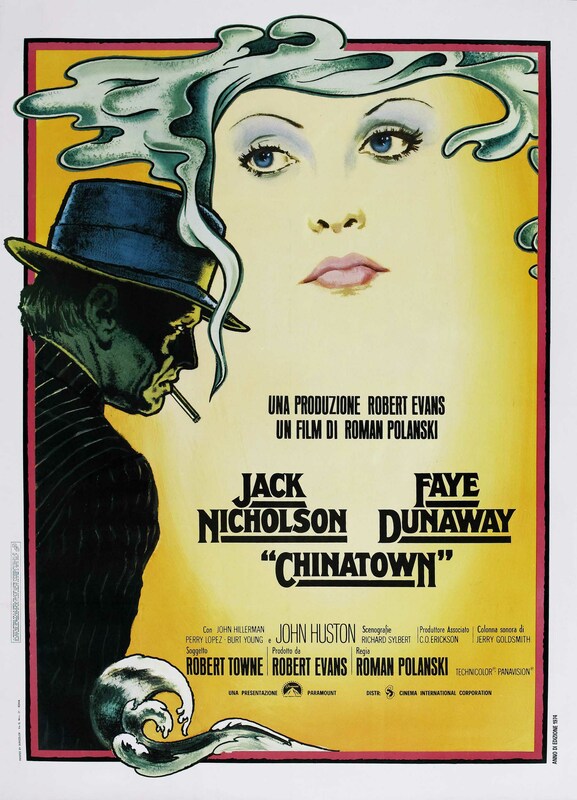 Chinatown is so layered, so well acted, so superbly written that it can be watched many times and something different just might be noticed with each viewing. Robert Towne‘s original screenplay (the only Oscar this movie won) could be put in a vault, removed in 90 years, and it would still be among the sharpest ever written. The 11-time Oscar-nominated Jack Nicholson stars in this picture about a monopoly over the California water supply during a severe drought in the ’30s. Nicholson plays Private Investigator J.J. Gittes (a.k.a. Jake), a smooth-talking slimeball who usually works on exposing marital infidelities to unfortunate spouses. He occasionally apologizes for his foul mouth and wears a fedora like nobody’s business. After a hypnotic, saxophone-dominated credit roll, the film begins in Gittes’ office where Jake explains to a client (Burt Young, Paulie of Rocky fame) that his wife has been two-timing him. Right away it’s obvious that Gittes is a puzzling character–he’s not a worthless rodent, but he’s certainly not your average good guy either. Gittes simply wants to make some dollars. As he says, “L.A.’s a small town. I just want to make a living.” As the film progresses, we discover that Gittes has a sordid past when we worked as a police detective in Chinatown with his arch-rival, Lou Escobar (Perry Lopez). The story leads to the final confrontation between the major players in Chinatown where a helpless Gittes confronts some demons. But that’s jumping ahead. The investigator is visited by the infamous Mrs. Mulwray, who claims her husband, Hollis, has been messing around and she wants proof. He stumbles onto something much bigger than a simple infidelity. Gittes follows Mr. Mulwray everywhere until he discovers that the man turned up drowned. He’s confused when he is later confronted by the real Mrs. Evelyn Mulwray (breathlessly played by the beautiful Faye Dunaway). She wants him to find out who murdered her husband. Gittes snoops around in more places than he should and discovers that the water monopoly is a giant conspiracy led by Hollis’ partner and Evelyn’s father, Noah Cross (played by Nicholson’s mentor, John Huston). In one of the most famous scenes in cinema history, Gittes’ nose is slit by a thug (director Roman Polanski) trying to deter him from snooping. To protect his damaged proboscis, Nicholson wears quite a distracting prop–a huge, white nose bandage. Nicholson wore the prop for a realistic period of time to allow such an injury to heal. Ironically, he plays a terribly vain character in Batman (as Jack Napier before he becomes The Joker), who wouldn’t be caught dead in such a get-up. But that shows the diversity of the 3-time Oscar-winner. Later, after sleeping with Mrs. Mulwray, getting beaten up by two more thugs, totalling his car, and suffering through two or three more plot twists, Gittes discovers that the phony Mrs. Mulwray was a pawn hired by the sinister Cross. And, hold onto your hats, Evelyn has a daughter…who is also her sister, Catherine. How could that be? Well, Cross was a naughty boy. Actually, he’s one of the best villains in Hollywood history. A great director, Huston is also a fine actor. So, when Gittes finally learns the truth, he helps Evelyn and Catherine escape from the vile clutches of Cross, who wants Catherine–“the only daughter I have left”. That leads to the explosive night in Chinatown. I won’t reveal the ending, save for the immortal final line, “Forget it, Jake. It’s Chinatown”. Nicholson’s smarminess and questioning grimaces reveal a great deal about his character and ignite what could have been slow and boring scenes. For instance, Gittes tries to light a cigarette while explaining the conspiracy to Evelyn. He fails to get the thing lit after several tries. He shrugs and gives up. This looks like it was a failed scene where the lighter was defective, but Polanski kept it because it works so well. After all, when things are falling apart in this man’s life, why should a cigarette co-operate? Jack’s “it figures” reaction is rather funny, too. One of Polanski’s gifts is the good sense to let the camera linger on his actors and allow for a scene to develop without constant dialogue. That technique hardly works these days and no one seems patient enough to try it. Too many directors are “cut-happy” and don’t want to let their actors act. However, Polanski was lucky enough to employ superstars like Nicholson and Dunaway. The film shows the racist, sexist, and often cruel attitudes of the economically-ravaged ’30s. Gittes is not a hero, but he’s one of the more complicated characters ever portrayed on the big screen. Perhaps this film also works so well because of the smoldering sexual chemistry between the two leads. Contrast those heated scenes with the macho exchanges between Nicholson and his surrogate father Huston. This is as smart a film as you’ll see where nothing is as simple as it seems. As for Jack, he plays his ultimate tortured character. Unlike The Joker or Jack Torrance, Jake Gittes is a complex introvert. He says little and doesn’t get to ride off in any sunsets with the girl. Unfortunately, he didn’t win his first Oscar until the following year in One Flew Over The Cuckoo’s Nest, his fifth nomination. He’s my favourite actor and he might still win a 4th Academy Award to establish a record for male actors. Chinatown is a four-star ground-breaker filled with superior dialogue and plot twists that might easily confuse the casual observer. You’ve got to pay attention to this layered story because the payoff is tremendous. Polanski and the producers did everything correctly, right down to the detailed period set design and the score by the great Jerry Goldsmith. This is the very best film noir ever shot. Watch it again and inhale a masterpiece because they don’t make ’em like this anymore.